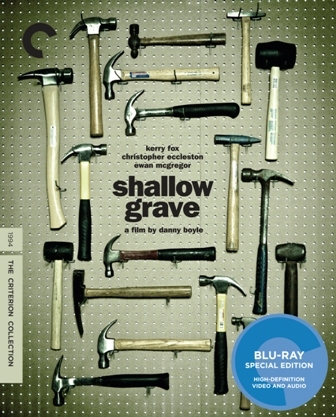 CHICAGO – Danny Boyle’s “Shallow Grave,” recently released on Criterion Blu-ray and DVD, is such a striking debut and has held up significantly better than many films of its day. Not only does it fully display future Oscar winner Danny Boyle’s notable degree of style but it’s a daring film in its willingness to present unlikable characters caught in a situation that they arguably deserve. The film opens with a succession of scenes that make Juliet (Kerry Fox), David (future “Doctor Who” Christopher Eccleston), and Alex (the breakthrough for Ewan McGregor) out to be total jerks. They mock the people who come to share a flat with them, are overly competitive, ridicule each other, and are generally loathsome. Boyle and screenwriter John Hodge (who would also work with the director on “Trainspotting,” “A Life less Ordinary,” and “The Beach”) don’t care if you don’t like their protagonists. In fact, it might be better if you don’t. The plot of “Shallow Grave” is Hitchockian in its simplicity. Three Edinburgh flatmates need a fourth. Hugo (Keith Allen) finally gets the gig and promptly drops dead of a drug overdose. They find a ton of money that belonged to their now-dead roomie. They keep it and try to dispose of Hugo. Things unravel from there. I’ve been lucky enough to interview Danny Boyle twice and he completely lives up to expectations. He’s a fascinating guy and, therefore, a spectacular participant in the art of the audio commentary. His new one for “Grave” is one of the best of the year to date. He offers history about the making of the film (the movie cost a million pounds) while also offering character and plot insight (how the jobs of each character dictate their morality and behavior) and just straight-up awesome trivia (David’s glasses were modeled after David Cronenberg’s and the sawing scene was inspired by “GoodFellas”). The man is so well-spoken. There are a few audio commentaries every year that could be used in film classes. Boyle’s on “Shallow Grave” is one of them. His insight into how his low budget actually made for a better film is particularly notable. The rest of the special features on “Shallow Grave” are pretty stellar as well, including a commentary by Hodge and new interviews with the stars. Once again, Criterion has taken a film that could have been a bit lost to history — “Shallow Grave” doesn’t get that much press when compared to some of its early-’90s peers — and given it treatment equivalent to a undeniable classic. In a good year to date, “Shallow Grave” is one of their best releases. This diabolical thriller was the first film from director Danny Boyle, producer Andrew Macdonald, and screenwriter John Hodge (the smashing team behind Trainspotting). 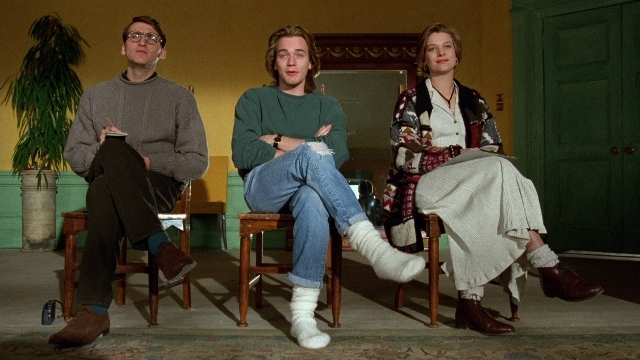 In Shallow Grave, three self-involved Edinburgh roommates-played by Kerry Fox (An Angel at My Table), Christopher Eccleston (Elizabeth), and Ewan McGregor (Beginners), in his first starring role-take in a brooding boarder. When he dies of an overdose, leaving a suitcase full of money, the trio embark on a series of very bad decisions, with extraordinarily grim consequences for all. Macabre but with a streak of offbeat humor, this stylistically influential tale of guilt and derangement is a full-throttle bit of Hitchcockian nastiness. “Shallow Grave” stars Christopher Eccleston, Kerry Fox, Ewan McGregor, and Keith Allen. It was written by John Hodge and directed by Danny Boyle. It was released on Criterion Blu-ray and DVD on June 12, 2012.